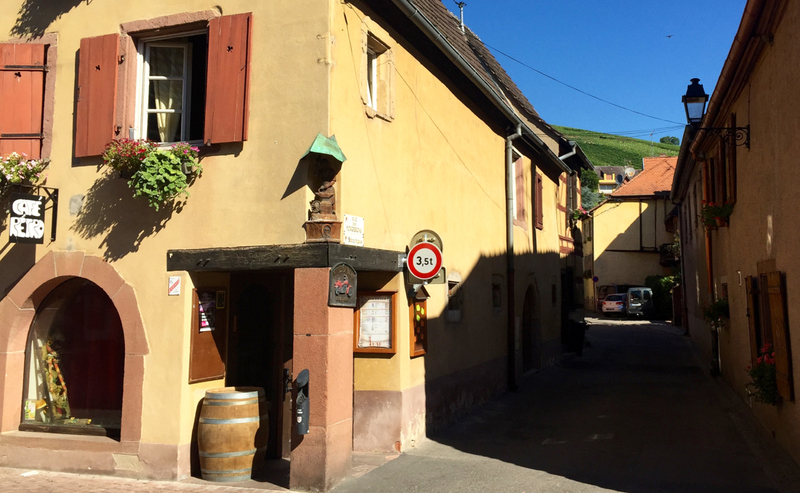 Alsace, a beautiful region on France’s north-eastern edge, is blessed by a sunny climate, vineyards that produce some of the world’s finest whites, and picture-perfect villages of half-timbered houses that have overflowing flower baskets on every window sill. 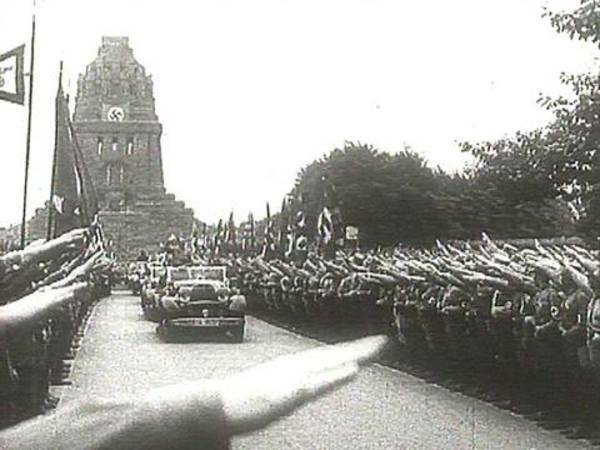 But Alsace’s wealth, and its strategic location on the left bank of the Rhine and at the foothills of the Vosges Mountains, have also caused it to be the focus of land-grabbing campaigns by both French and German rulers. In fact, although originally part of the (German) Holy Roman Empire, Alsace has been forced to switch sides between France and Germany so many times since the days of Louis XIV that even many locals have lost count. In 1870, the Franco-Prussian war ended up in the creation of the German Reich, and caused Alsace, and its sister region of Lorraine, to be attached to Germany. By the time Wilhelm II was crowned German Emperor in 1888, the Alsatians’ hearts and minds had still not exactly warmed to their new rulers. In a curious mix of Romance/Germanic cultures, most Alsatians had been quite happy to be French, even though the local language, Elsässisch (which is still spoken by older people today) is a German dialect. Cue Wilhelm’s passion for royal PR. Very much aware of how new the German imperial title was, and how tentative its recognition, he grabbed every opportunity of legitimizing it with links to his forebears. A Roman emperor in the family tree would have been perfect, but failing that, any link to the Staufen rulers of the High Middle Ages would also do. And that is how Wilhelm recognized a perfect opportunity for educating the population of Alsace when the city of Sélestat, some 70 km south of Strasbourg, presented him with the ruins of the Hohkönigburg (its German name, literally High Kings’ Castle) – which was once upon a time owned by Barbarossa, the most famous Staufer Emperor of all. This huge castle, perched atop the ridge of the Vosges and looking down on the Alsace plain and over the Rhine to the German Black Forest, was in ruins since the tender ministrations of Louis XIV’s troops, but it had an imperial pedigree that made it very much fit for Wilhelm’s nation-building purposes. 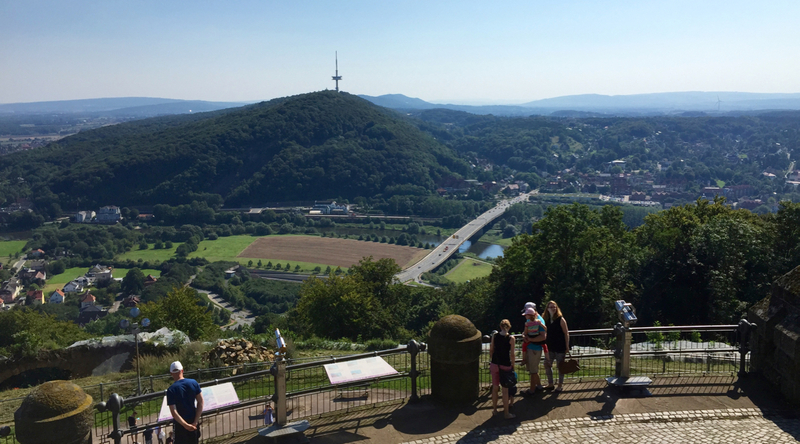 He set about restoring it in much the same way as he (and his grandfather, Wilhelm I) rebuilt the Kaiser-Pfalz at Goslar: with a heavy-handed nationalist touch. 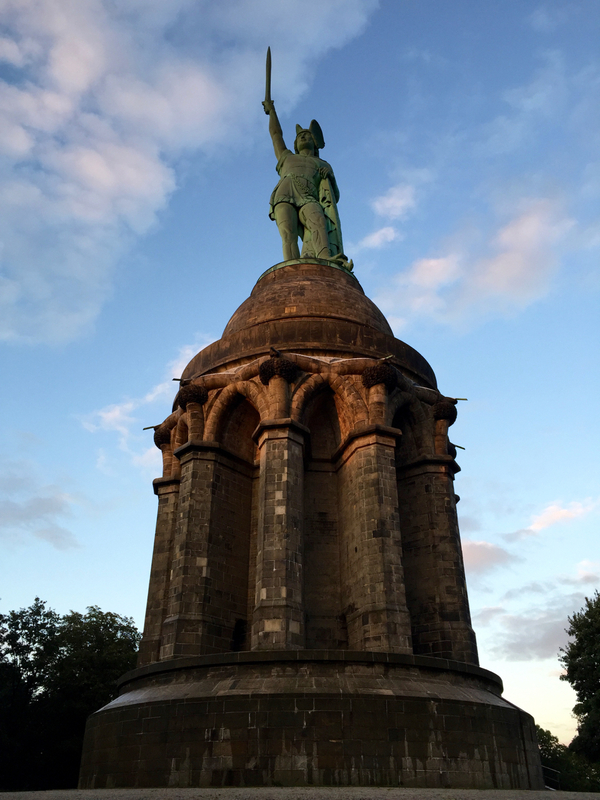 The additional twist in the case of this particular symbol of Germanness was its location at the very western fringe of the Empire – as a counterweight of sorts to the Marienburg in current Poland (a castle I hope to pay a visit for this blog later on). 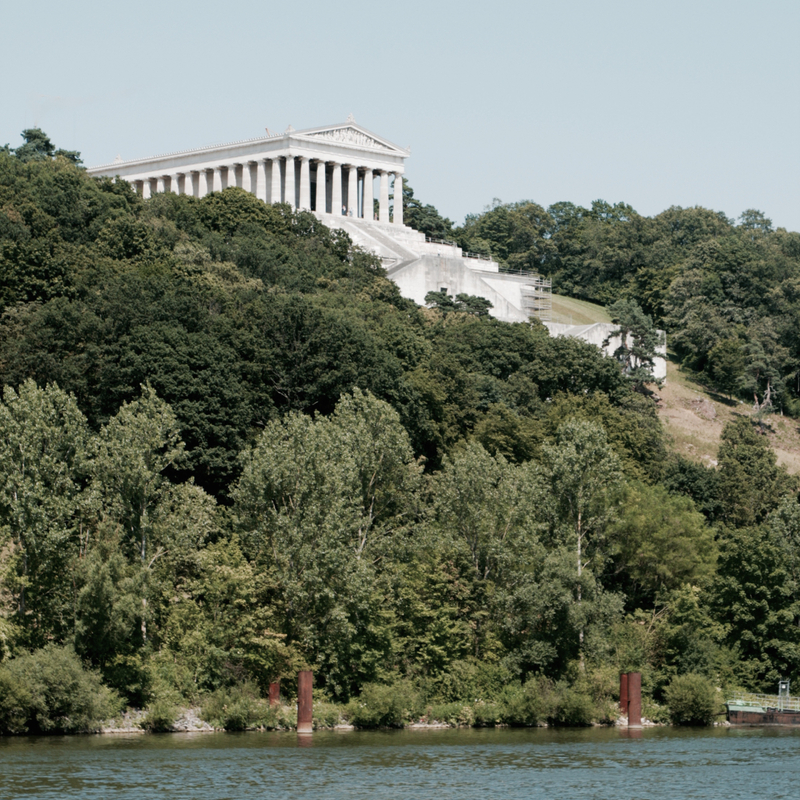 He gave the job to Berlin architect Bodo Ebhardt, who specialised in restoring castles. 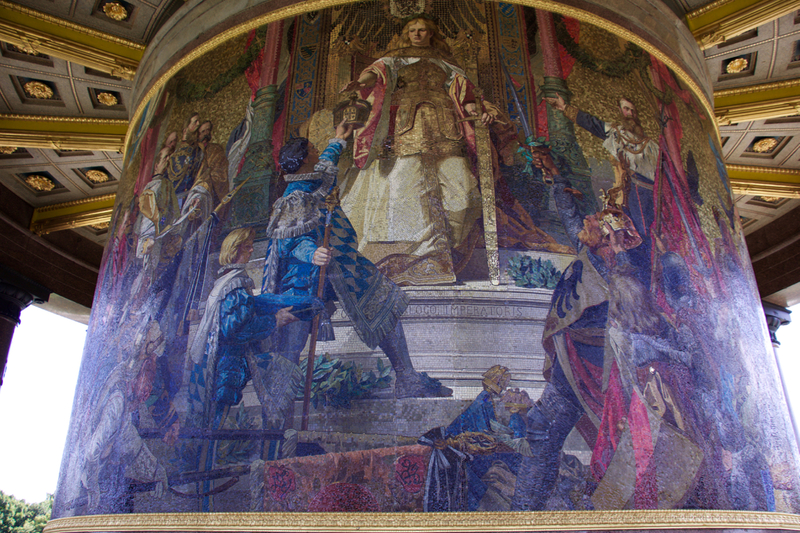 Ebhardt is the German equivalent of Eugène Viollet-le-Duc – another 19th century restorer of historical treasures, and similarly accused later on of violating the historical substance of the buildings he touched. 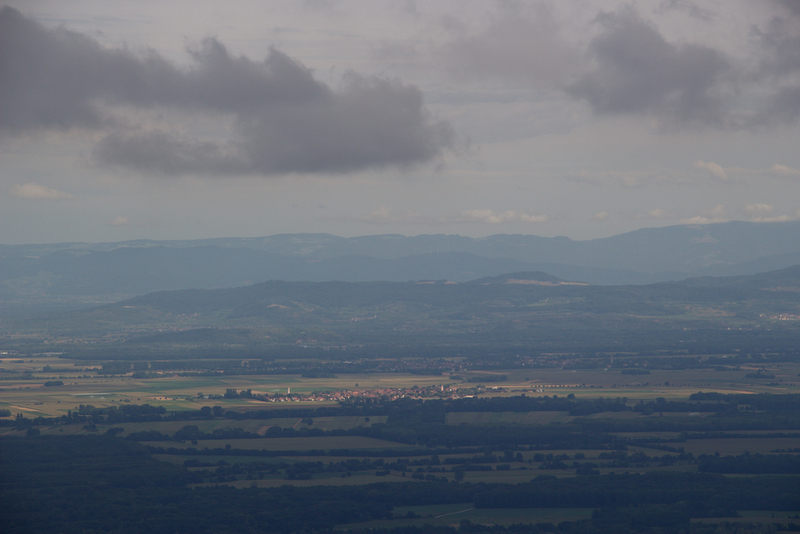 Today, of course, Alsace is very much French again. Since World War II, school children have been taught exclusively in French, which means that Elsässisch is on the point of extinction. One elder wine merchant told me some fifteen years ago that he was only able to communicate with his grandchildren in his own language once they started learning German in high school. 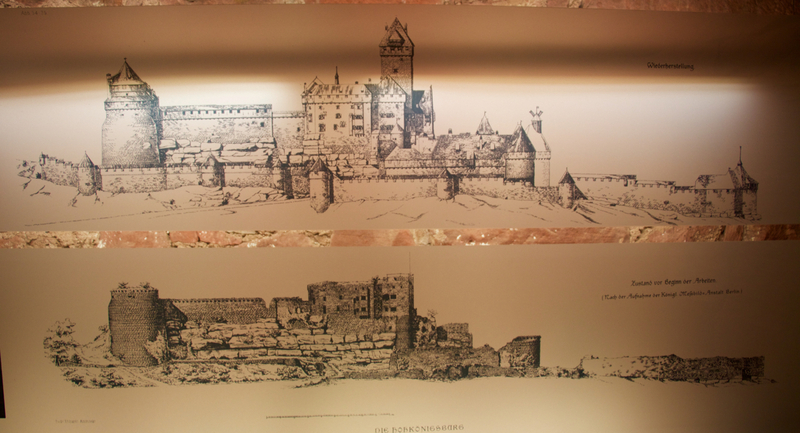 The museum that Haut-Koenigsbourg has been ever since Wilhelm finished its restoration in 1908 got the same treatment. 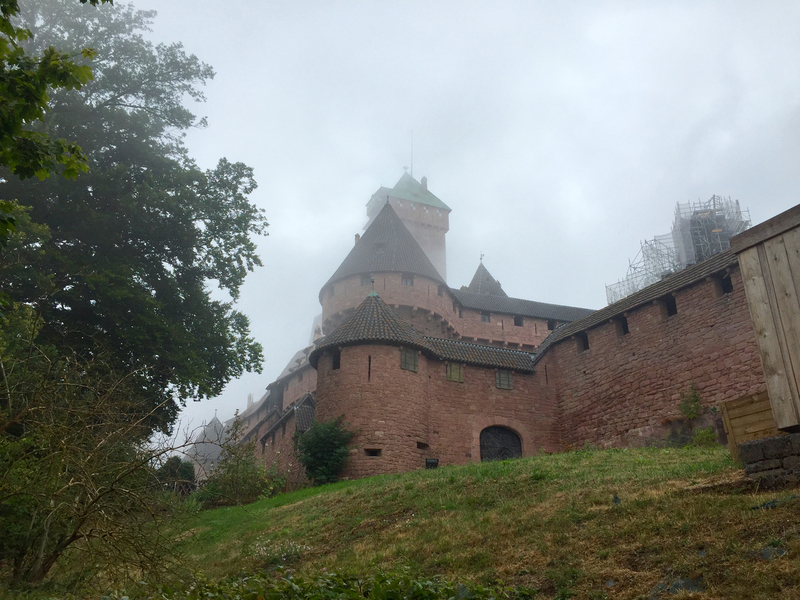 Until a few years ago, La République Française completely ignored its Wilhelmine history and treated it as an example of a mediaeval castle – with tournaments, pageantry and a book and gift shop full of knights’ armour for children and books on chivalry. 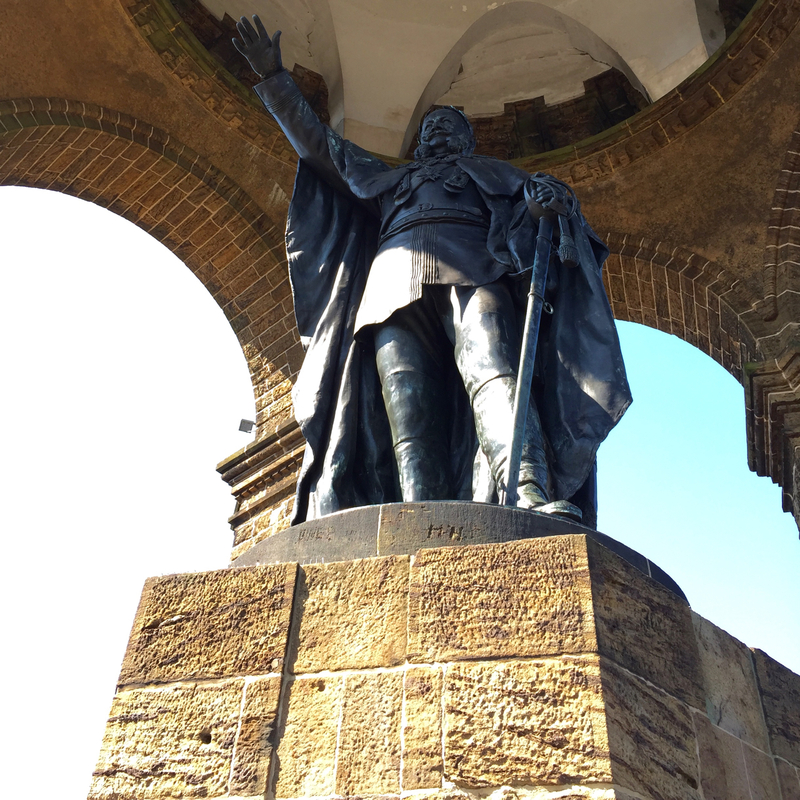 At last returned to the castle he had restored – Kaiser Wilhelm II. I was delighted to find that on my visit this year, the focus of the exhibition, and also the story told by the tour guides, had shifted to the castle’s more recent political history. 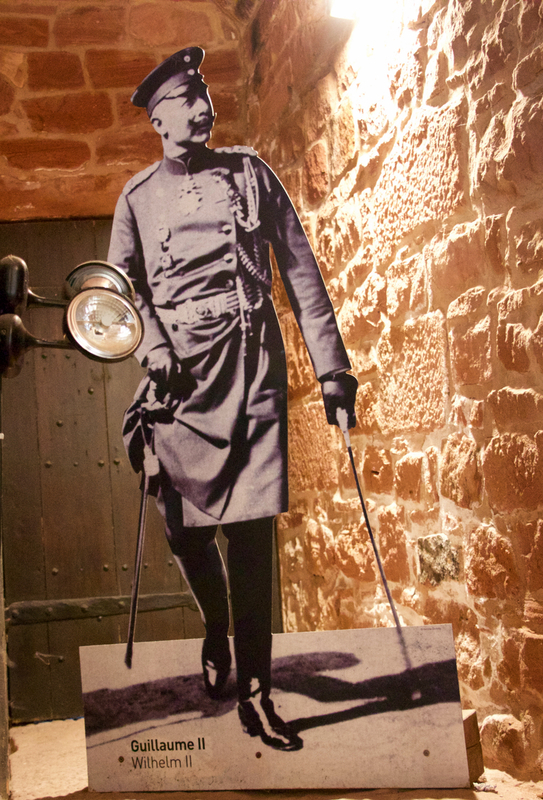 There were displays on the restoration by Ebhardt, there were some infographics on the German Reich, and there even was a life-size cutout of the Kaiser himself! Finally, I was also able to get a good photograph of the famous fender that Wilhelm had installed on his last visit to Haut-Koenigsbourg, in April 1918. The inscription reads “Ich habe es nicht gewollt WII”, or “I did not want this”. It is still not clear exactly what the Kaiser meant. 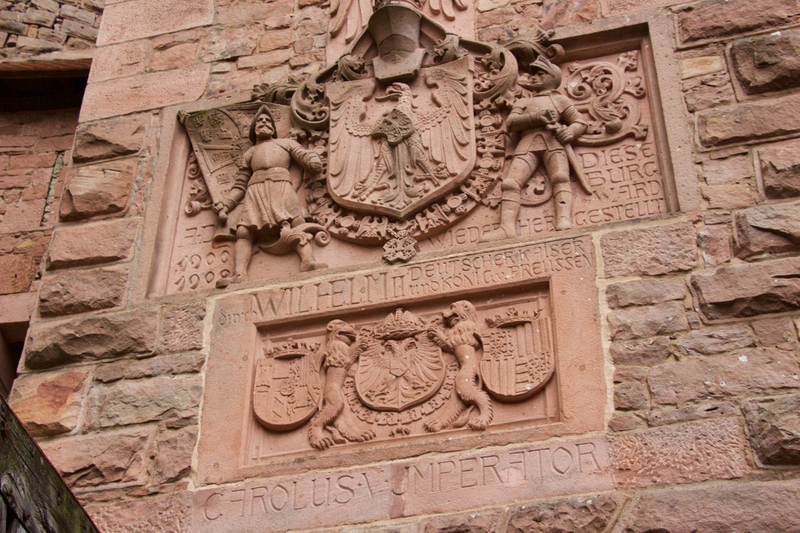 Some pundits say the statement refers to the castle’s tasteless restoration, but the most common interpretation of the inscription today is that it is an apology of sorts for the atrocities of World War I.
Wilhelm II’s famous fender from 1918 at Haut Koenigsbourg castle. The text translates as “I did not want this”. 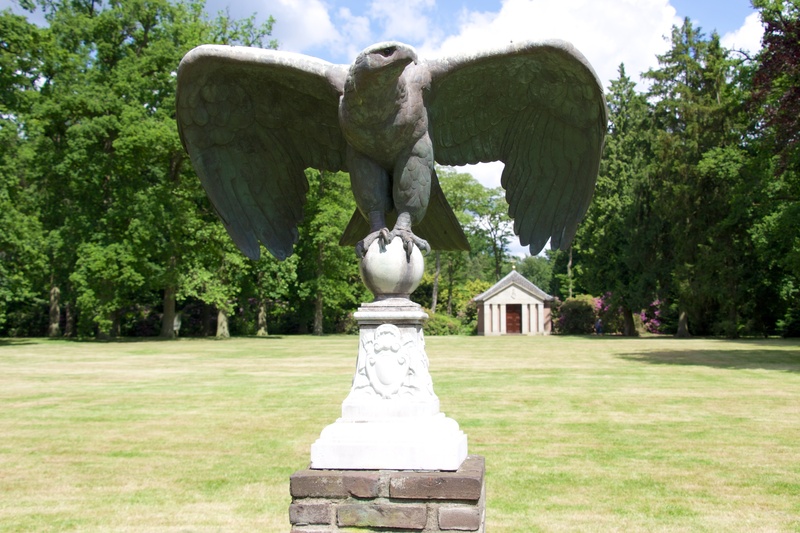 I revisited Museum Huis Doorn last weekend. This country house, in a wooded area on the banks of the Rhine near Utrecht, is where Kaiser Wilhelm II ended up after seeking refuge in The Netherlands in November 1918. From the date of his forced abdication onwards, he never travelled far from Doorn. He spent his days chopping wood (yes, really), and never gave up hoping to be able to return to the Fatherland as Kaiser. He died at Huis Doorn, at the age of 82, in 1941. 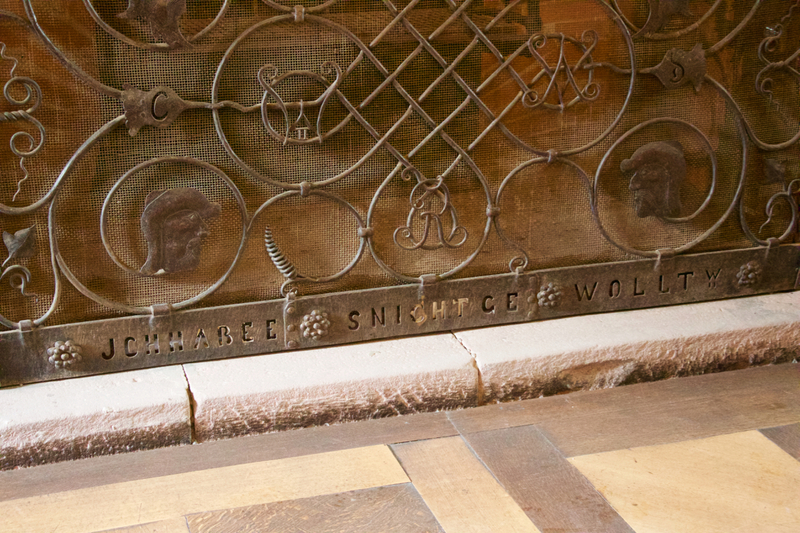 His remains are still there, in a purpose-built mausoleum in the museum grounds. Occasionally, groups of Prussian nostalgists come from Germany to lay wreaths at his coffin – the last occasion was the Kaiser’s 155th birthday in January 2014. The picture below is taken through one of the mausoleum’s windows, and is probably as close as you’ll get to seeing an actual dead emperor on this blog! When I visited, the house grounds were taken over by a living history event depicting daily life in WW I – both in the armed forces as well as at home. I didn’t know this, but there’s a distinction between living history and historical reenactment: whilst the latter is more about getting the details of the battles right, the former focuses on depicting daily life, costumes, and arts and crafts as close to the historical original as possible, usually with an educational purpose. 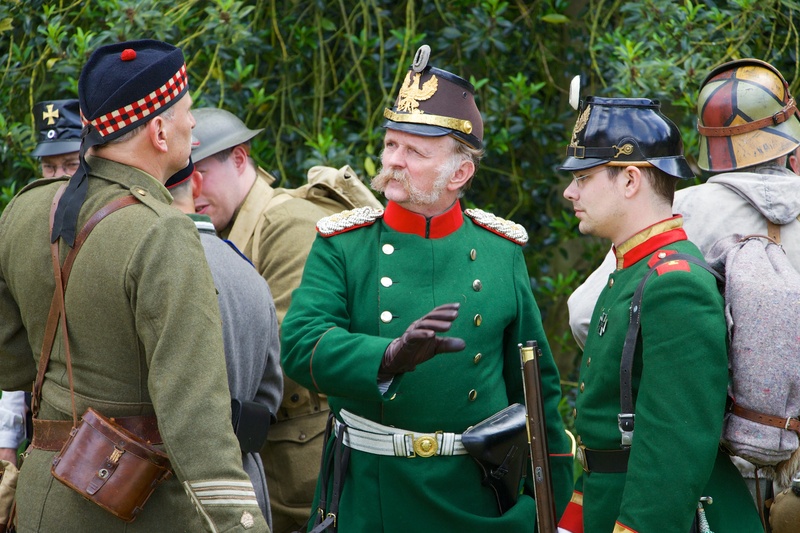 For the event at Huis Doorn, living history groups had turned up from Belgium, the UK, France, the Netherlands and Germany. Now you should know that, as a trained historian, I usually even frown upon historical novels, because of the poetic license that I imagine their authors to take. I like my history unfrivolous and hard-core. But I was fascinated by the living history people. The ones I spoke to really knew their stuff and also were able to put their roles into context. 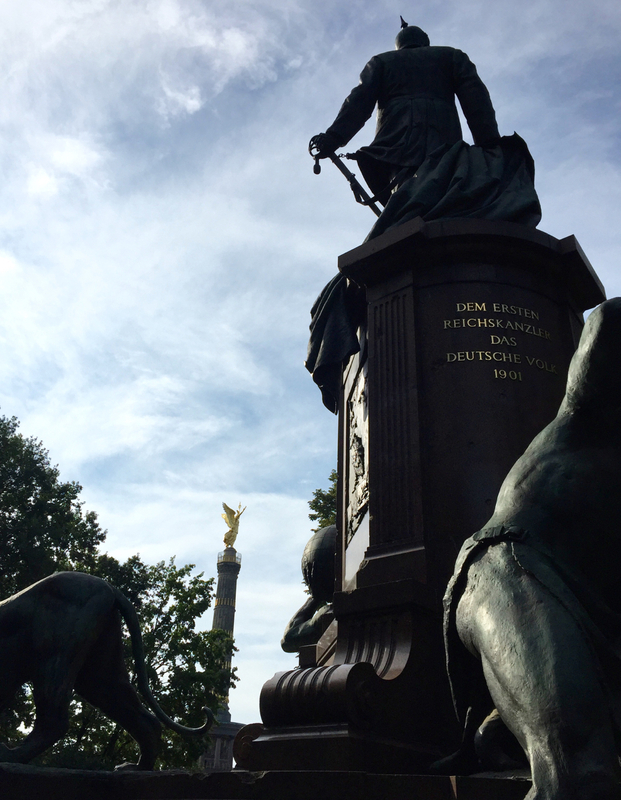 I spoke to a German guy called Siggi, who played the role of an ensign in the Prussian army. 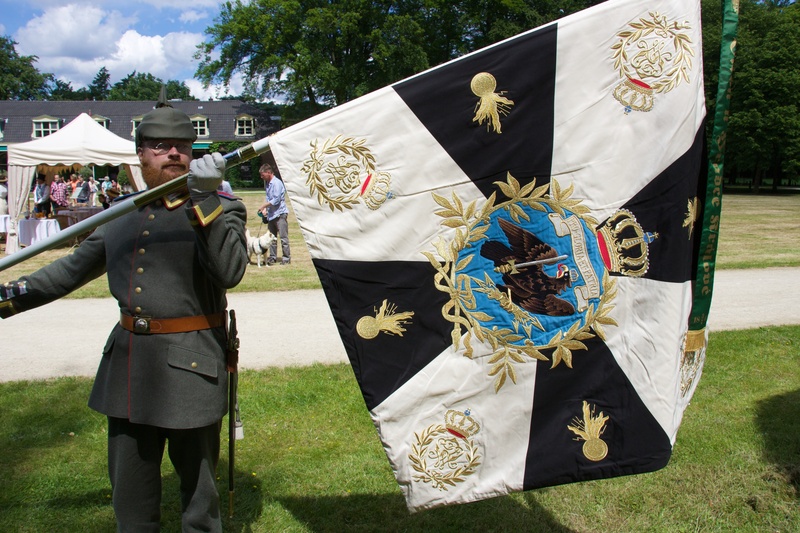 He had a great beard and a wonderful banner showing the colours of his regiment. I was curious how ‘military’ these guys actually were, so I asked Siggi if he had ever served in the army. It turned out he’d served in the Bundeswehr for four years as an NCO at some point. Because he’d been a sergeant-major during his stint in the modern army, that’s the historical uniform he also liked to wear when role-playing, because it was what he identified with most. But many of his fellow role-players had not served in the army, or if they had, wore any uniform they chose. According to Siggi, there were no set rules for this. When I asked Siggi what he imagined the biggest difference there would have been between life in the modern army as opposed to 100 years ago, he immediately said ‘discipline’ – the discipline to which soldiers were subjected to back then was much stricter than today. Transgressions which would have lost you a weekend’s leave back then would not even be noticed today. 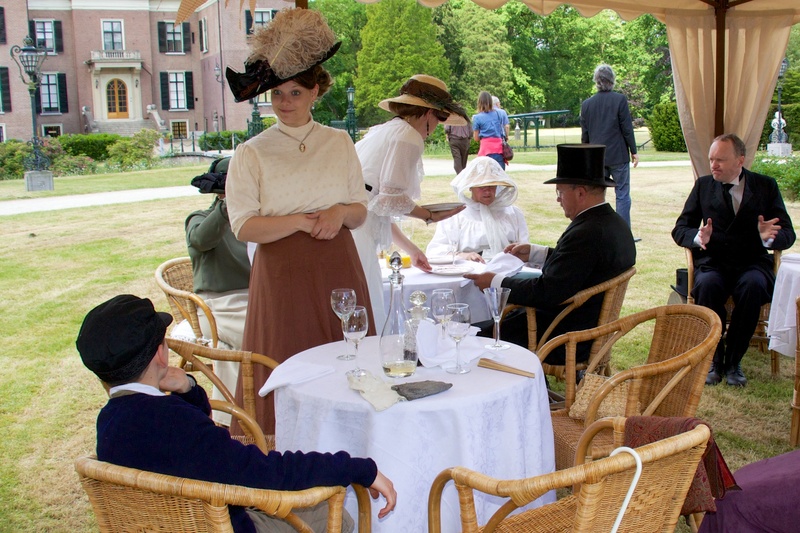 For depicting life ‘back home’, the organisers had chosen to represent the upper classes: ‘grand-mère’s birthday on the lawn’, complete with croquet, cucumber sandwiches and deferential staff. All very Downton-esque and beautifully done. For the people in this group, it meant sitting in their lawn chairs the whole afternoon, making conversation about grand-mère and other family matters, and as far as I could see they never dropped their roles. An interesting point in the proceedings arrived when a ‘Dutch officer’ began explaining the uniforms of four ‘Prussian soldiers’ to the public. This took place in front of grand-mère’s marquee and gave a nice contrast between military life and aristocratic hedonism. 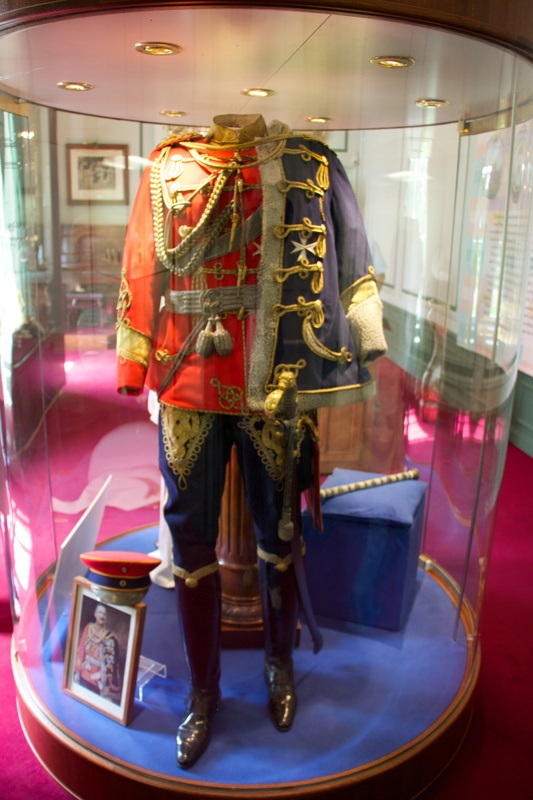 As the Kaiser himself loved to dress up in all kinds of military uniforms, and certainly showed a lot of awareness of Prussian history (see Berlin’s Terracotta army – the Statues of the Kaiser’s Victory Boulevard), I am sure he would have approved of such an event at the home where he spent the last twenty-three years of his life. As you’ve probably been able to read between the lines, this hard-core historian was very much won over by the commitment and hard work that the living history people put in their displays. Will I find some funny dress and join them? Probably not, if only because I’d probably get bored after 15 minutes of sitting still. Will I go again? Definitely – there’s a lot to learn by viewing these displays and talking to people who are so passionate about their chosen period.